A new official community website has been launched by the board of presidents. 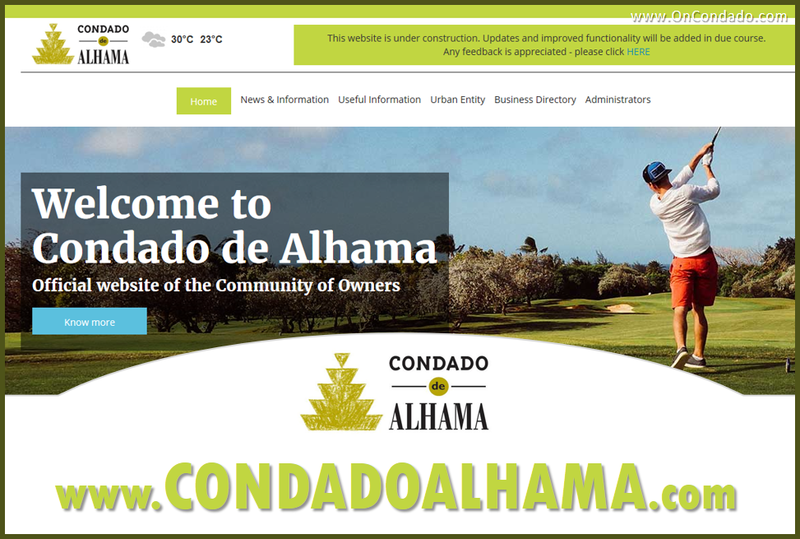 The new website site can be found at www.condadoalhama.com and will be used to communicate with owners and to publish important information about the resort. The website has been designed and created by Mediaelx, an Elche based web design company, who were selected to deliver the project after being chosen from several design companies who tendered a quote. A Website committee made up of Presidents and owners who have volunteered to help will over see the ongoing management of the community website. The main reason is to aid communication with owners and anyone else interested in the resort. In previous years, communication to owners has been by email via the administrators. In the case of Mileniun Levantes tenure as Administrator, some critics complained that emails were sometimes too slow to be sent out, that they did not always reach all owners and in some cases message content may have been altered. The new website has the ability for garden Presidents to email their respective community whenever they choose and this should aid communication between owners and their elected Presidents.. The first phase of the website is being launched to get owners familiar with the site will continue to be improved as a work in progress. Many features are planned to enhance it’s functionality and will be added over the coming months. Features that are set to be added will be a system for registering you car with security, an owners login area and a buy and sell market place. If you have any suggestions for the website please contact the Board of Presidents.